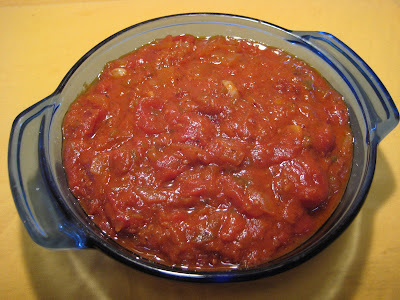 The very first time I ever made stewed tomatoes, I used my sister Jeanie's recipe. For years and years, if you had asked me what recipe I use, I'd have said "I always use Jeanie's recipe." It wasn't until recently, when I made them for our weekly Project Runway group, that I thought to myself "This isn't Jeanie's recipe at all!" Without even realizing it, over the years I've sort of tweaked it here and changed it there to suit my own tastes, and now it's very different from the original. For one thing, I like them to be nice and sweet, so my tomatoes are much sweeter. For another thing, I use canned tomatoes instead of fresh. If you want to know all the other differences, you'll just have to ask My Jeanie! For me, this recipe goes hand in hand with Baked Macaroni and Cheese. I literally never make one without the other. In a large heavy pot, pour a few generous glugs of olive oil. Add butter and place over medium heat until the butter melts and the oil shimmers. Add the onion and green pepper. Saute until they become soft. Add garlic and sugar. Stir well. Add tomatoes and tomato paste along with the dried herbs and spices. Reduce to a low heat and let it simmer for at least 30 minutes. I usually let it go for much longer, like an hour or more. The longer it simmers, the better it is. Stir it every so often to make sure it doesn't burn on the bottom. I always add an extra drizzle of olive oil just before I serve it, just to make it shiny and glossy and to add a little extra flavor. Make sure you simmer it over a low heat. It'll help to insure that you won't burn it on the bottom. When you add the salt and pepper, hold back a little. Add a little less than you think you should add. As it simmers, it reduces and the flavors become more concentrated. You don't want your finished product to be too salty. You can always go back and adjust the seasoning at the end if you need to. I suppose you could make a smaller batch, but I always figure "If I'm gonna make it, I might as well make it!" and go for the big batch.